The art of long-lining, is a developmental skill which is beneficial for both equestrian and horse. It is used extensively in the training of the harness horse, but is equally important as a training tool for the riding horse. Learning and perfecting the art of long-lining has a lasting and enhancing effect on your horse’s ability to bend and flex, work in straight lines, engage the hindquarters improving cadence and lighten in the bridle. It also teaches patience. Many professional trainers of both gaited horses and young novice horses use this technique as part of their training regime. Everyone can learn how to long-line, providing they are willing to commit to the time and focus to perfect this skill. Done properly, your horse can attain a greater level of ability and athleticism. Ideally, a bitting rig and side check bridle with crupper would be a first choice. This is a relatively inexpensive piece of equipment to purchase. A regular saddle and bridle can double in place of a bitting rig, but you have far less flexibility when using this combination. If a bitting rig is not obtainable, a surcingle with several ring positions is also preferred. Your bit should be a snaffle type. I recommend a half-cheek driving snaffle that would not allow the bit to slide through the mouth. Egg Butts or D-Ring snaffles of medium thickness are also recommended. A leverage bit (one that contains a shank) is not ideal for this purpose. The handler should outfit themselves with a sturdy pair of snug fitting driving or riding gloves. This is a necessary piece of apparel you will require. If you are not accustomed to wearing gloves, this is the time to get acquainted. Leather or simulated leather is the choice of glove. Bare hands invite injury. A driving whip is also a required piece of equipment. In European countries, the rein board is used extensively to help educate the novice in the handling of their lines and whip. We use this apparatus for teaching our driving clients and those learning to longe horses for the first time. It allows the student the opportunity to hone their skills and develop a feel for the line. The rein board is more forgiving than the horse when the student makes a mistake or is awkward in their technique. Once perfected, the student can advance to the horse. Practice makes perfect so learning how to take up line quickly, quietly and safely is not only good for the horse, but also equally kind to the handler. When using a surcingle or backpad, be sure to place the pad approximately one-hand’s width behind the base of the horse’s withers. It should not be placed at the base of the withers. A crupper worn under a horse’s tail helps hold the backpad in place and prevents it from riding forward. However, a horse must be conditioned to wearing a crupper first. A side check on the bridle allows some freedom for the horse, but prevents the horse from lowering his head too far. The check should be adjusted to the natural head carriage of the individual horse. The rings of the surcingle that guide the lines to the bit from the backpad, graduate down with the least resistance coming from the top ring of the back pad, to the highest leverage pressure with the bottom ring. It is recommend to begin with the top ring, or the path of least resistance to begin your long-lining. Finding the most desirable and safe zone in which to begin long-lining is the handler’s first priority. Stand approximately eight feet behind the horse and six feet off to the side of the horse on the inside circle that you wish to eventually turn. Never stand directly behind the horse when in motion and driving forward. You could become a target of flying hooves and would never hold a bolting horse from this position. Before you start, accustom your horse to the feel of the lines by gently touching its sides with the lines loose, beginning high on the back and then continuing down to the lower leg above the hock. Don’t allow the lines to travel any lower than hock height. One caution is that you should always have an assistant for safety reasons. Combining voice commands with a whip aid, encourage the horse to walk forward. You want to maintain light but continuous contact with the bit. If you allow your lines to slacken and therefore lose contact, your horse will wander. On the other hand, too much contact will confuse the horse. It may lay on the bit, stop, or try to evade the pressure by going sideways. Head tossing is also another clue that your rein pressure may be too severe or unyielding. 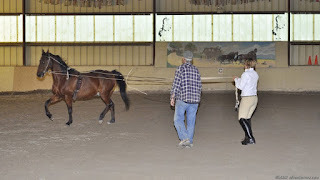 Working a corner or circle requires the handler to pay particular attention and coordinated with the horse. If you simply follow a horse through a corner, you lose contact and direction. As you approach a corner, you must let the horse take the lead and hang back slightly slowing your pace in order to maintain rein contact with the bit as the horse begins to bend. Bending a horse around a corner is often the most difficult task of long-lining that a novice must learn. You will carry your whip at a 45 degree angle to the ground and to the reins. From this position you can swing the whip into the required area you need for direction. A whip is considered an aid and should be carried when long-lining. As in driving, the whip replaces a rider’s legs. As you progress in developing your long-lining skills, you will include changes of direction. To accomplish this next step, the rein in which direction you now wish to go, comes over the horse’s quarters first. For instance, if you want to turn right, the right rein first passes over the horse’s hip. Next you take a step behind the horse then quietly lift the opposite rein over the horse’s back until you are now positioned on the other side of the horse. Take this step of direction change slowly and quietly. Do not rush it or become confused with your lines. It should be a smooth slow transition. When asking a horse to bend, make a straight line back to your hip using your hand and forearm in one singular motion. Don’t pull your rein out to the side, or break your wrist out. It should be a clean line from your hand to forearm straight back to your hip. Once you can maintain a consistency to your long-lining at the walk, you may proceed to the next gait. Start with collecting your rein to compensate for the horse’s shorter frame when it goes to the trot. Shorten just enough to accomplish this task and keep a light open rein so that you don’t create a stonewall affect on the bit by having a tightly closed fist. Using your voice command and the light touch of a whip aid, encourage the horse to move forward into the bridle and up to the trot. The skills you have just learned will now be intensified at the trot and your reaction and reflex will be tested. Again, you want to strive for smoothness in every movement. Your changes of direction at the trot will be carried out identical to those you have practiced at the walk. Remember the emphasis will be on timeliness and smoothness. Use your whip to encourage more forward motion as required, or to help with correction. Keep in mind it is a tool and should not be just held in the hand totally passive at all times. Lastly, don’t forget the halt. Having a horse stand quietly and straight in long lines goes a long way in teaching the horse patience, especially when mounting. Use a watch or clock and time how long your horse stands. One minute is a considerable amount of time. Once mastered, long-lining is a tool you can use throughout your horse’s active life to keep it supple and performing at its best. Drive on!